Master Flooring Solutions was recently called into Twin Towns Club Banora to upgrade the swimming pool deck with a new synthetic turf installation.We inspected the site and found the existing synthetic grass matting in need of replacement, with repairs required to the underfloor surface prior to new matting being installed. We inspected the site and found the existing synthetic turf matting in need of replacement, with repairs required to the underfloor surface prior to new matting being installed. 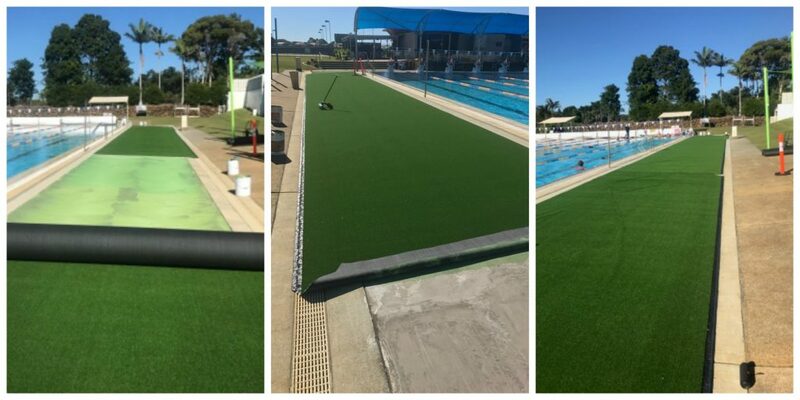 Our team undertook to uplift the existing synthetic turf matting along the length of the 50-metre pool. This was followed by concrete remediation works to allow for a perfect sub-floor on which to install new synthetic turf matting. 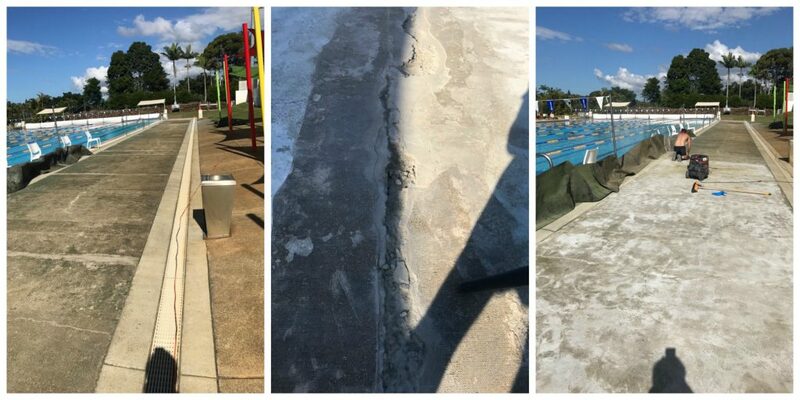 These works included grinding of the pool deck whilst still operational. The pool’s management was happy with our attempts to reduce dust and mess whilst uplifting and grinding the concrete. We could not simply install the new matting without addressing the underfloor issues. Smoothing off any imperfections in the concrete is essential to ensure the perfect quality of the finished surface. Our team experienced perfect weather conditions during the three-day remediation and installation process. On the final day, we undertook the layout of materials and adhered the new synthetic turf matting to the concrete with quality all-weather adhesive. 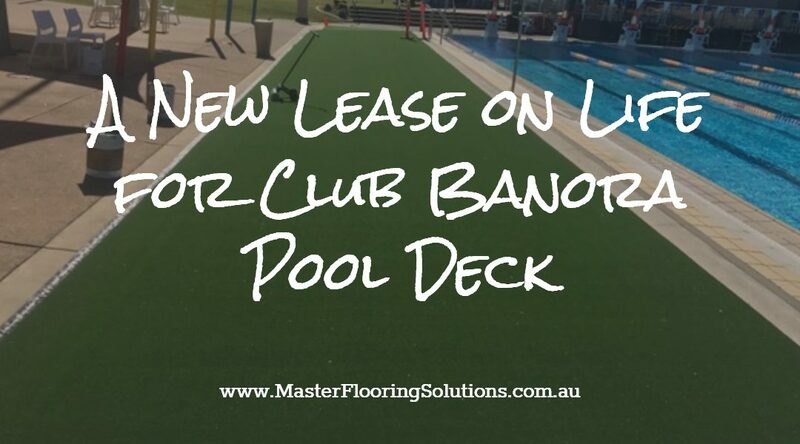 The final outcome is a rejuvenated pool deck with a smooth, fresh surface, making the facility ready to welcome swimmers in the coming Spring and Summer months. 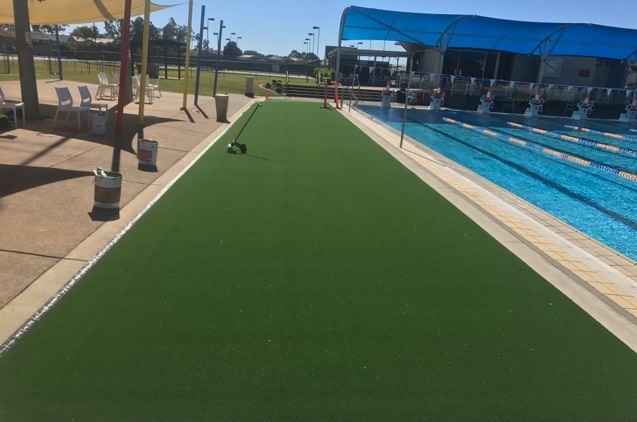 The synthetic turf product we laid at this site is called Urban Turf – Test Wicket 9mm. If you have an area which experiences high traffic and you need a similar outcome, call us at Master Flooring Solutions. We’ll be happy to inspect your site and advise on the best solution for your flooring needs.